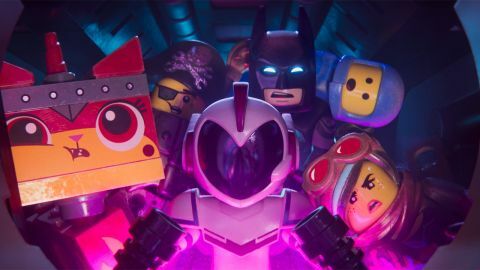 The Lego Movie 2 review: "The toys are starting to look worn, but this is hardly the playdate from hell"
The toys are starting to look worn, but this is hardly the playdate from hell. The yellow banana has real star appeal. Just when you thought it was safe to go back in the auditorium... along comes an earworm even deadlier than Everything is Awesome. Behold Catchy Song, which (repeatedly) insists: "This song’s gonna get stuck inside your heaaaaad..." Yes. Yes, it does. Question is, does the film follow suit? If not quite unforgettable, The Lego Movie 2 leaves the memory of a good time. It’s another fast, smart, block-buster, constructed with enough cheek (the meta gags don’t stop when the credits roll), and charm (textured, tactile CG animation that feels hand-crafted) for you to park the fact that it’s a wall-to-wall, wallet-seeking toy ad. Trouble is, as the fourth Lego-branded movie in five years, it feels a little, well, assembly line. For one thing, there’s a very dark grey elephant in the room: Batman. A scene-stealer in The Lego Movie, then star of his own standalone, the Daft Knight (voiced again by Will Arnett) isn’t unwelcome, but his familiar schtick is in danger of coming un-stuck; it’s a shame that director Mike Mitchell (Trolls) doesn’t inch the spotlight towards other DC heroes. At least the plot ventures to new pastures – smash-happy Duplo invaders have turned Bricksburg into a dust-choked dump. Into this Mad Max-esque mess steps General Mayhem (Stephanie Beatriz), who drags Wyldstyle (Elizabeth Banks) off to the Systar System; cue a rescue attempt by the blindly upbeat Emmet (Chris Pratt). The good news is that, far from being reduced to damsel in distress, the ninja-cool Wyldstyle is even more of a co-tagonist this time round, even in the face of the film’s lead doubling down as Emmett’s new bud Rex Dangervest, who’s an utter Pratt. The script (co-penned by The Lego Movie directors Phil Lord and Christopher Miller) strives to make this not only a galactic journey but an emotional one, exploring key characters’ true colours. Yet as the story starts to encroach on Toy Story-sequel territory, it doesn’t so much pull the heartstrings as drag the pace. What’s more, new (mini)figures like Mayhem and Tiffany Haddish’s Queen Watevra Wa-Nabi start to seem short-changed. And as for poor old Unikitty (Alison Brie), you almost want to pin up a ‘missing’ poster. Still, there is awesome-ness here. The sci-fi settings – dystopian grit-scape, rainbow-coloured cosmos – are dazzlers; the satire is playful not snarky; and as you’d expect, several unexpected cameos. It doesn’t sweat too hard to appease both kids and adults – the latter’s pain much felt in a scene you might describe as product mis-placement. For more hotly anticipated films, check out our list of the upcoming movies you don't want to miss - and while you're at it, why not take a look at the films we thought were the best movies of 2018?